Our country is facing a dangerous situation. Prices of fuel and food are soaring; unemployment is at an all-time high; workers, farmers, common people are all suffering. To divert attention away from the Modi Government’s failure to give us ‘acche din’, some forces try to foment Hindu-Muslim hatred and violence on one or the other pretext. But what is worse – anyone who questions the Government or speaks against hatred, is getting abuses, threats or violence to silence them. 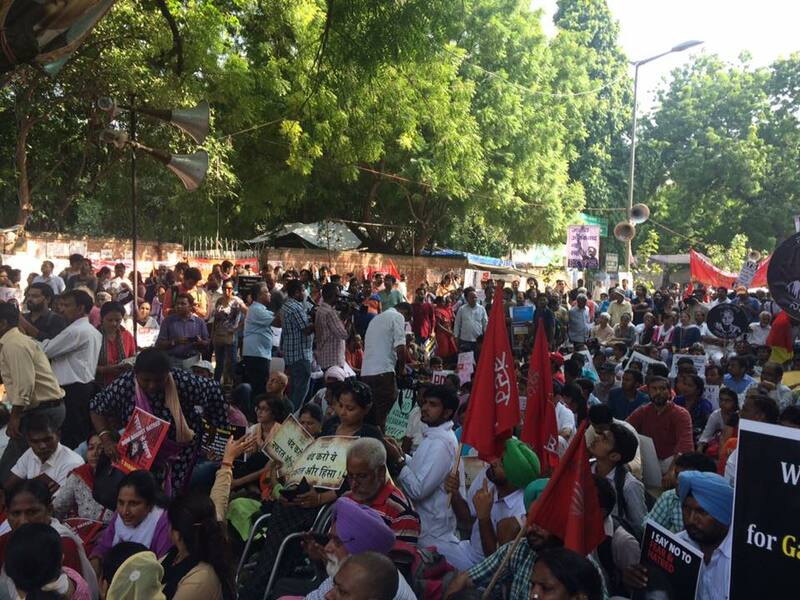 Workers who demand wages and rights are being lathicharged or jailed. Farmers demanding loan waivers are getting bullets instead. Recently, the whole country was shocked when journalist and activist Gauri Lankesh, a prominent voice against hatred, was shot dead at the gate of her own home in Bengaluru. Earlier, anti-superstition activist Narendra Dabholkar, left activist Govind Pansare and writer and former VC Professor Kalburgi were shot dead in a similar way. Gauri Lankesh’s murder was celebrated by persons whom Prime Minister Modi follows on twitter. Such persons have also issued threats to other voices of dissent. Please join a People’s March from Mandi House to Parliament Street on 5 October – one month after Gauri Lankesh’s murder.